The restoration has begun on the front fibreglass panel on the F34. The whole section requires removal to allow repairs to be carried out to the panel, and this requires to be done from the rear to preserve the shape. 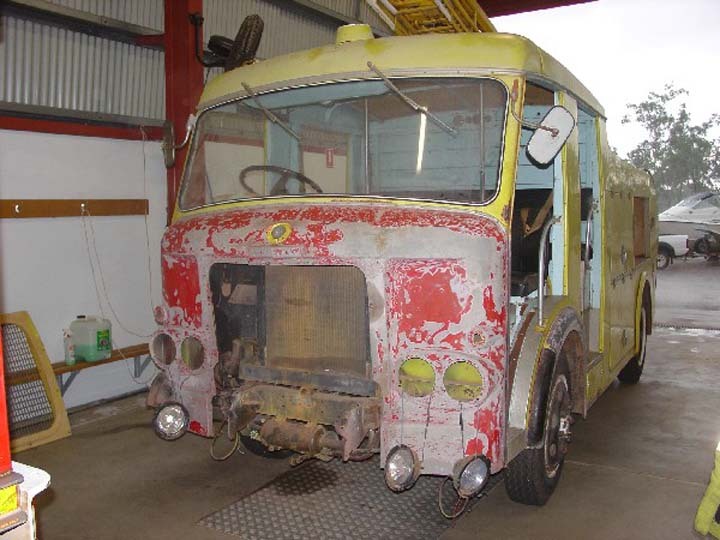 The red is the original Dennis factory colour, the truck being repainted yellow in 1978. Final restoration will see the fire truck red once more. Lou, thanks for the great pics, this is such an interesting machine, , , , ! Added by Pavel, Western Australia on 13 November 2007. Added by Guy Ellis on 14 November 2007. Well Lou, you've finally gone and done it.Lets hope you guys remember how to put it back together.Great in yellow, I'm now looking forward to seeing it back in its original colour of red in a few weeks time???. Added by Pete Matten on 14 November 2007.